In the Gujarati language there is a saying ‘ena ghar ma ghee keda chhe’, meaning that that person is pretty much well off, wealth wise. When I was growing up, Saturday would be the day of the week that along with the usual full lunch of dal, shaak, rotli and bhaat, we would have some sweet dish like shrikhand, lapsi, meethi sev or ghee kera. When my kids were growing up, I would give them ghee kera often with roti but on the condition that they would also eat the vegetable we had made. 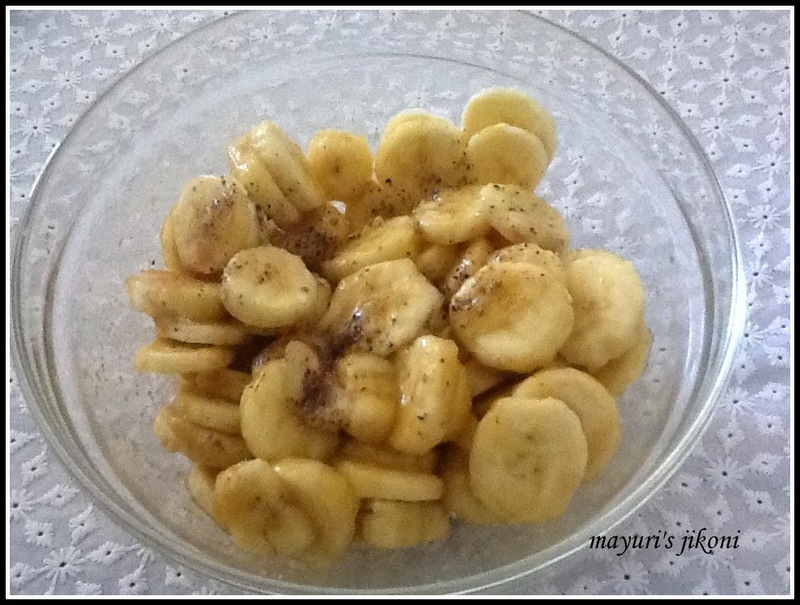 My daughter Nami called it banana nu shaak. After the kids left home, I don’t make it that often but today I made some. Brought back fond memories of my childhood and my kids. After the ghee kera would be all over, my mum or dad would put hot kadhi in the bowl, swirl it around and then add it to the rice. It tasted so sweet and yummy. Its a quick fix when you crave for something sweet and go on try and bribe your kids with it, the way I use to. I could eat ghee kera without any other vegetables with roti or on its own. Are you still wondering what I am talking about? Okay lets get to the recipe. Its the most easiest recipe. The reason I am posting this recipe is to share it with you all and hope you and family love it just the way ours did and still do. Peel the bananas. Cut into slices which are not too thin or too thick. Add the sugar and ghee and mix it. My mum use to add more ghee. You can add more or less, whichever you prefer. Don’t use over ripe bananas otherwise the mixture will become mushy. Delicious Mayuri, we make it as prasad during poojas. Simple and yet so delicious..